Family Cloth. What is it? Have you heard of this? If you haven’t heard of family cloth before, don’t worry. Not many have. Family cloth is definitely one of those crunchy extremes and it’s also a topic that most people just naturally shy away from. Family cloth gives a slightly gross mental image. Most people hear it and think it’s one cloth that is shared by the whole family. Ummm… no. Thankfully that is not what family cloth is! Family cloth is just an odd name (probably used because we already have the term mama cloth so someone just decided to keep the ____ cloth pattern) but they are really just cloth wipes. I’ve talked about cloth wipes before. Most of the time when you hear about cloth wipes, people are talking about reusable wipes for babies. This is also probably why we have the term family cloth because we wanted to differentiate between baby cloth wipes and cloth wipes for people who can actually use the toilet! That’s right, family cloth is reusable toilet paper! Now don’t run away thinking that reusable toilet paper the grossest thing known to mankind. Hear me out. 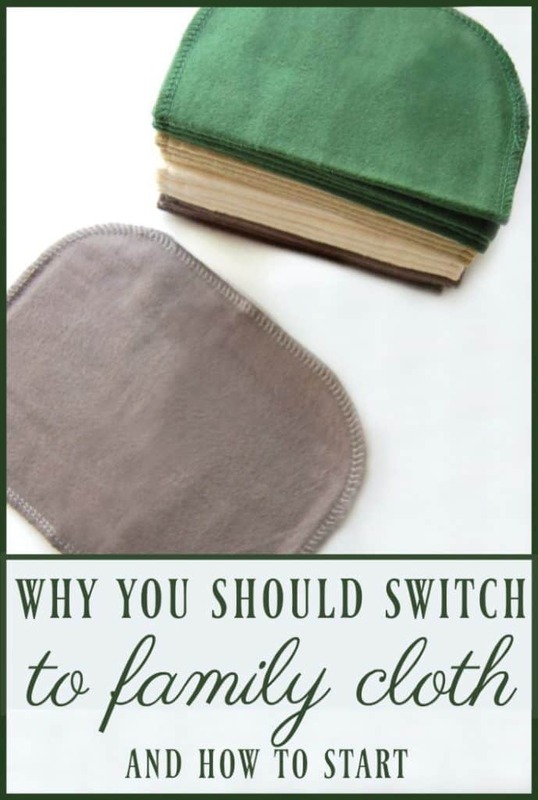 It is reusable but that doesn’t mean you aren’t washing your family cloth in-between uses! Each time you use a family cloth, it is perfectly clean! Just like each time you put on your underwear; they get washed, dried, and cleaned. “But we don’t share underwear!” I’m sure that’s what you are telling me through the screen. Yes, you are correct. However, let’s just think about it. You wash all your laundry together so anything that was on someone’s laundry is already getting mixed in with yours. You are sharing those germs. But are you really? When you wash and dry your laundry, those germs are killed. Anything that was lingering on dirty laundry is gone. Everyone gets perfectly clean clothes so sharing or no sharing, things are clean for their next use. Reusable – This is about as green as you can get! Family cloth is zero waste which is something that can’t be said for toilet paper! No toxic chemicals – We don’t think about toilet paper containing chemicals but they can! Recycled toilet paper has been found to contain BPA and BPS. Recycled or not, most toilet paper is bleached and you are wiping those bleached sheets on some of your most sensitive parts! Softer – Whether you use 1-ply or 2-ply toilet paper, family cloth has got both beat when it comes to softness! No quilted paper can compare! Keeps You Cleaner – Family cloth is more substantial than toilet paper so it does a better job of cleaning you (especially if you use a wet family cloth!) but it is also more durable so no more dirty hands from poking holes through toilet paper. Fun colors and prints – Ok, probably not a benefit at all but it does make something as boring as toilet paper fun! Family cloth is just like toilet paper. Just wipe with a cloth wipe instead of toilet paper! It’s that easy. Many people do like to wet the cloth wipe first particularly for going #2 but it’s not a necessity. Not THAT ready for Family Cloth? You can totally just use family cloth for going #1. Dealing with pee is a lot less intimidating than dealing with poop. Switching to family cloth for #1 will still save you a ton of toilet paper! How Much Family Cloth Do You Need? A good rule of thumb is to have 5 cloth wipes per person per day. You will want a minimum of 2 days worth so that you always have some while washing a load. Although I’d recommend having a big enough stash for at least 4 days so that you don’t have to do laundry all the time. So if you have one person using family cloth you would want 20 cloth wipes for a 4 day stash. Alternately, my friends at Creekside Kid recommend a supply of 40-50 wipes per person which will get that person through a week! Clean Family Cloth – You can keep clean family cloth in a basket or box on top of the toilet. You could also store in a clean wet bag, or even a nearby drawer. Some people like to store dirty family cloth in water but I find that unnecessary. Just like with storing dirty cloth diapers; keeping dirty family cloth in a dry area until wash day works just fine. Less fuss is always a plus in my department! Many families just toss their family cloth in with their cloth diapers. If you do not use cloth diapers than you could just throw your family cloth in with the towels. There are tons of places that you can buy family cloth. You can even make your own family cloth/cloth wipes. I personally love buying my family cloth from Creekside Kid. Their cloth wipes are great quality and come in tons of colors and patterns. I seriously want to buy them all! Want more ways to go super green in the bathroom? Hmm. You may have me convinced to give this a try! I’ll let you know if we do! I use ‘family cloth’. It is just me, so there are no sharing issues, and I always have TP out for visitors. I use a small step-trash can with a take out liner for the used ones. It sits right by the toilet. There has never been any smell. I take the liner out and straight to the washer. Rinse it out and it goes back. I usually wash only once a week, but I only use it for #1 right now. I also use a wet ‘rinse’ made from olive oil, vitamin E oil, aloe vera gel, as I had no straight, lavender E.O., Tea Tree E.O. ( I am suffering from a systemic candida infection, so I have added an anti-yeast recipe from Rosemary Gladstar) and water. I use an old vinegar bottle with an alcohol spout, shake, put on the wipe and go! My cloths are from Amazon: “Under the Nile baby wipes”. They are the perfect size and work great. I have been using this method for about a year now, and really love it! I’m not as sure about using for #2, but really can’t see a reason not to. Maybe someday! I do still stock up on TP, but more for visitors (not many) and for bartering when the SHTF! It really isn’t as yucky as you’d think and because there is no water involved in the ‘soaking’ (even for #2)(which WOULD cause smell and stuff to grow. Water, that is), it is odorless. I like the idea of a baby wipe solution in a bottle. I use a solution that I found on the internet some years ago. It consists of water a teaspoon of castile soap (you can add a squirt of witch hazel and a drop of essential oil if you want to) Put the solution in a small plastic bottle and carry some paper towels with you and you are good too go! Paper towels should NOT be flushed down a toilet. Only TP should go. This is really interesting. What is the fabric used, do you know? Family Cloth Wipes uses flannel. Flannel seems to be a favorite material when it comes to family cloth/cloth wipes. Ok, I see this but the amount of poop particles in the washing machine and then that transferring to your clothes. I don’t see this as healthy at all. I honestly see this as being a huge health risk. I’ve heard of family cloth before and am intrigued, but I don’t see my husband and teenagers going for it right now. Maybe just I should make the switch…? Thanks for linking up at the Healthy Living Link Party! Quite frankly, I think ya’ll have fell out of the back of a turnip truck and took one to many bumps to the head! I’m not a germaphobe, but the whole idea of this grosses me out! Interesting…I wonder if I can get my teens on board with this 😉 Thanks for adding this to FromTheFarm, it’s one of this week’s favorites! Hope to see you again soon! I’ve never heard of this before. Sounds like a great way to help the environment. I’ve done cloth diapers with my little ones, so I can understand the purpose of this. Thanks so much for sharing this at Savoring Saturdays linky party! Hope you’ll join us again later today. I have now found a use for my ‘no longer needed’ cloth menstrual pads. Excellent! I’m gonna start my family on these but ad a badet to our toilet for a cleaner experience. Do you pre-wash the cloths used for #2? I don’t use cloth wipes for my toddlers dirty diapers, but I do for the EBF baby since it’s water soluble. I don’t want to need to rinse poop out of wipes! I’ve found that there’s no need to rinse poop out of wipes before washing. With cloth wipes and diapers I usually use the diaper to get off any of the heavy stuff so the wipes stay pretty light in the poop department. Get a bowl mounted bidet and you will already be cleaner then possible with toilet paper. Then just use your family clothes to dry yourself off. Hmmmm. I think this would be a difficult sell to my family, though I could definitely see it after the use of a bidet. I agree! 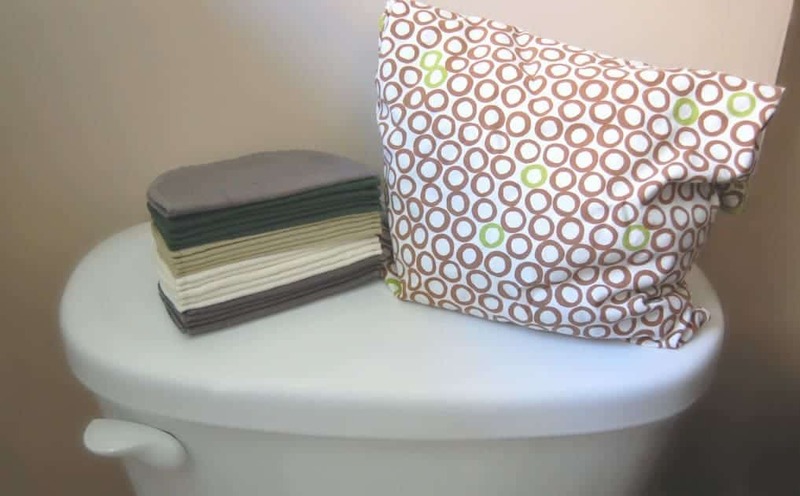 I used cloth diapers with all 3 kids 90% of the time and the bidet was a lifesaver! Yes! I think I could only do this if I also had a handheld bidet installed, which is something I want anyway. It would definitely work for me, but I am not sure how well it would work for an independent, potty training toddler. I used cloth wipes on my girls when they were in diapers so when we potty trained we just continued using the cloth wipes…. Of course, there’s be some training if they are used to using (and flushing) toilet paper. What a neat idea. I’m a nanny and one of the families I work for uses cloth diapers and reusable wipes, so I’ve been storing and washing those for over a year now. I can’t believe I did’t make the connection to use a similar system for adult wipes. I’m not sure if my husband will be up for the change but I am seriously considering having us switch to this. 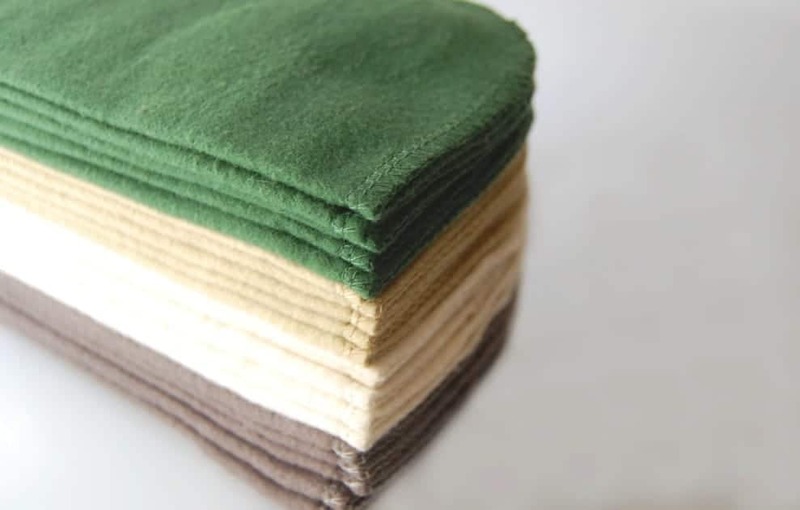 As far as cloth colors go, do you find that a darker color hides any stains/discoloration better or does a light colored cloth work better since you can stain treat them longer/more often and not worry about losing the color? Dark colors hide better but even the light ones do well. 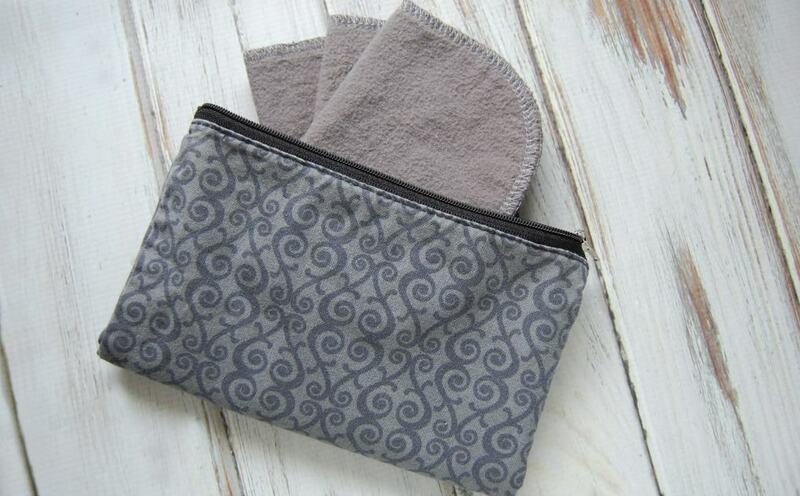 Like reusable wipes for babies… they don’t get stained too bad. Bum guns are the way to go! No paper and no energy wasted in washing either! Interesting but it does not appeal to me. In Asia and some culture they use water to wash after using the toilet . Unfortunately in the west we have pedestal toilet this is not conducive to wash the nether regions, unless you have a special water jets for that purpose. Like they have in for disable people. Aside from them being unhygienic and gross with the possibility of spreading infections, that is way, way too much laundry to do. How much hot water and detergent would be used? Not to mention the energy from the washer and dryer! Much better, I think, to buy a responsible bathroom tissue (unbleached, sustainably produced and made in the USA ) Better for us and the environment. It’s not unhygienic as they get washed. And you really don’t add more laundry to your tasks… most people just toss them in with the towels. So very gross…thought we left the Middle Ages! I use a spray nozzle hose that attaches to the toilet to wash first, removing any residue. No need to touch area to be cleaned. Then I dry my clean bottom. We use family cloth exclusively and we use a bidet for cleaning when going number 2, so the wipes are really easy to wash, since the wipes are for drying after first washing ourselves with water. When my babies were in diapers, I used a diaper sprayer to clean dirty cloth diapers. My youngest is 5, so we finished using cloth diapers 3 years ago, but I use the diaper sprayer as our bidet now. My family is very happy with the switch. It’s much cleaner and drastically reduces irritation and residue issues associated with using just dry paper to clean after #2. My husband and son actually complain about having to use the bathroom outside of the house where there’s no bidet. I put the wipes in a lidded small garbage can and wash them every few days. I throw them in with a load of towels and wash on hot. I commented recently about us “giving up” toilet paper and my husband said that getting rid of toilet paper was an upgrade, not a sacrifice. We rent currently but when we buy a house, we’re installing a bidet there, for sure. It’s definitely a learning curve. I’ve found that smaller is better, but don’t cut them too small because they will shrink in the wash. 8 x 8 inches is a good start. Wash them before use, because I find that brand new unwashed cloth is too slick and doesn’t “pick up” well, at the risk of TMI. It gets slightly coarser in the wash, but not rough. I live by myself, so no need to worry about sharing. I wash them out in the sink in hot water after use, before washing them in the washing machine. Two years ago, I bought flannel baby blankets at a thrift shop for 25 cents each. and cut them into squares, I’ve used them all this time. I should have stitched the edges, but I didn’t. I use these for my bottom, make up removal, and other messy things. They are stored in a basket in the bathroom. I live in Europe and have a bidet. They are perfect for using there. My laundry room is next to my bathroom, so they go into the towel basket. I’ve toilet paper for guests and for when my own mess exceeds what I want in my washer. It’s a cost effective, comfortable and environmentally friendly option, but it’s not for everyone. I installed a bidet which with today’s set ups shouldn’t be an issue even if you are renting. it means that our family cloth is really only used to dry off water cleaned bums. Because of this, used cloths just go in with the regular laundry like other undies would. As my kids are still young and I don’t trust them to not flush said family cloth down into our septic system instead of placing it into the laundry basket, they still use TP. But hubby and I are almost exclusively on family cloth now. So I suppose my question is, is it more green to use recycled toilet paper products or these that need to be washed and dried usually using fossil fuels. We purchase wind though I’m curious if anyone has researched the environmental impact of both? Is BPA *actually* harmful though? I’ve never seen a study that says it is, but if you have I’d love to read it. We have traveled in countries where the plumbing couldn’t handle toilet tissue. The only option was to throw the used paper in a receptacle. It was an icky sight and the smell was nauseating. We found that people in India and Pakistan use their left hand to wipe and washing the hand could be problematic as there was often no sink or soap, I have IBS and cloth just won’t do. I would have to use several and the idea of depositing them into a diaper pail or bucket has no appeal at all. A bidet isn’t in the cards so I will use toilet tissue and make up for it by reducing the use of paper towels and other paper products. Now that’s sensible! Reduce your environmental impact in other ways (like reducing overall paper and water use) and use the darn TP for what its made for. I wonder if making them out of old t-shirts or even ole ready-to-discard underwear (minus the elastic) as these sources of cloth are soft, sturdy, and launder well. Has anyone tried making their own family clothes? It is just me and my spouse (no kids to “sell” on this change). Does anyone have any recipes for the wash-up solution put on these clothes? You can definitely make your own! Jersey (t-shirt material) is a nice option because it doesn’t fray so it doesn’t need to be sewn. I’ve also heard people use flannel for the same reason but mine frayed when I tried unsewn flannel. As for washing solution, just toss in the laundry with regular laundry detergent. I started with flannel squares sewn around edges. I only use for number one. I moved to white terry cloth wash rags. The terry does a much better job!!! Why not just get a bidet instead? This sounds intriguing, but you may want to rethink this process. I learned recently that although clothing seems clean after being washed and dried (not water, laundry soap, and then in a clothes dryer), tests show that the clothing is still loaded with bacteria. We live in a world full of germs, and function quite well with them most of the time, but after learning that laundry only looks and smells clean after washing and drying, I would be afraid of cross contamination between family members, especially if one member has the flu. Which is better, 1-ply family cloth or 2-plu family cloth? I don’t know that one is better than the other. I personally like the feel of 1-ply better. I’ve used a 2-ply cloth wipe before and I didn’t like how it felt when the two ply’s rubbed against each other but that was just a personal thing and now performance thing.